SOLD - 69 Chino Ave. - Quincy Real Estate, South Shore Real Estate, SALES & LEASING! 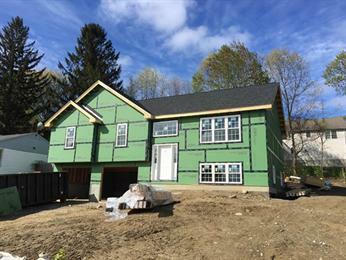 Home / SOLD – 69 Chino Ave.
New Construction, building is well underway on this 2000sqft split level ranch set to be completed in 45 days. This home boast an open floor plan with 11ft cathedral ceilings in the main living room and master bedroom, three full bathrooms, three bedrooms on the main floor, kitchen with recessed lighting, granite, stainless appliances and a large slider to an oversize 16X12 deck. The finished basement provides additional space to be used as bedroom or family room. This home checks off all the boxes with great highway access, close proximity to Umass Medical, and much more, act soon and the buyer will have there choice of tile, hardwood, carpet, cabinets, and granite. I would like more information regarding a property at SOLD - 69 Chino Ave.